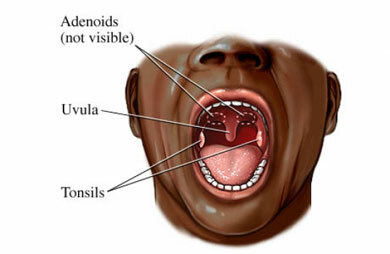 The tonsils are glands in the back of the throat. A tonsillectomy is the surgical removal of the tonsils. General anesthesia is the most common. You will be asleep . If needed, the surgery can also be done with sedation and local anesthesia. Each tonsil will be grasped with a special tool. The tonsils will be cut away from the back of the throat and taken out. This may be done with a scalpel or hot knife. An electrical current, or clamps and ties will be used to stop bleeding . You may be able to leave after the procedure. Some people may need to stay in the hospital for up to 2 days. If you have problems, you may need to stay longer. After you are fully awake, alert, and stable, you may be able to leave. Avoid talking, coughing, and singing for 1 week. Avoid spicy, acidic, and foods that are harder to eat. Eat soft foods for about 3-4 days. Slowlyreturn to a normal diet. Don't swallow hard items such as crackers or cookies. They may injure the back of your throat. Tonsillectomy. EBSCO DynaMed Plus website. Available at: https://www.dynamed.com/topics/dmp~AN~T114262/Tonsillectomy . Updated June 21, 2018. Accessed August 24 ,2018. Tonsillectomy and adenoids postop. American Academy of Otolaryngology—Head and Neck Surgery website. Available at: https://www.entnet.org//content/tonsillectomy-and-adenoids-postop. Accessed August 24, 2018. Tonsils and tonsillectomies. Kids Health—Nemours Foundation website. Available at: https://kidshealth.org/en/parents/tonsil.html. Updated May 2013. Accessed August 24, 2018. 4/16/2009 DynaMed Plus Systematic Literature Surveillance https://www.dynamed.com/topics/dmp~AN~T114262/Tonsillectomy : Burton MJ, Glasziou PP. Tonsillectomy or adeno-tonsillectomy versus non-surgical treatment for chronic/recurrent acute tonsillitis. Cochrane Database Syst Rev. 2009;(1):CD001802.